I truly believe that amazing things are happening within Liverpool's digital and creative sector. Liverpool's production of world class work means we're setting our own benchmarks – a foundation for continued improvements. With this comes an intense passion for social values. This was exemplified by our last Creative Kitchen: Made Here event, which was focused on “Tech for Good”. Here we saw three amazing talks from the Fresh group, So-Mo and FACT. Each taking us through their journeys, looking to use digital technology to directly improve the lives of real people. Alongside the talks we ran a campaign to support The Whitechapel Centre, a local homeless support charity. The campaign was targeted at the creative and digital community, calling for donations of old coats, clothes, sleeping bags, non-perishable food and toiletries on the day of the event. We had a life-affirming response. 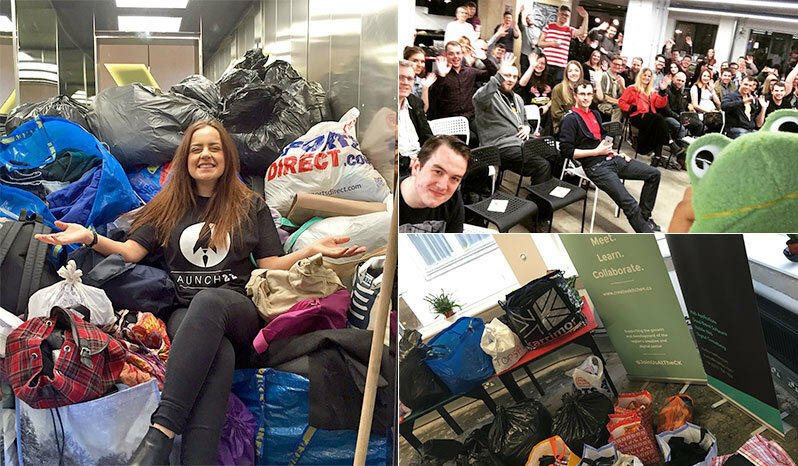 Thousands of items were donated at our two collection points at Baltic Creative and Launch 22. With a few people going above and beyond – the guys at Apposing buying 10 new sleeping bags and the amazing team at Juxdit collecting rucksacks and bags and filling them with tampons and feminine hygiene products to help women living on the streets. Our event wound down, the beer and wine bottles have been cleared away – but the campaign continues. Christmas is especially cold and emotionally painful for those who can't share the period with loved ones. We might feel that pang of guilt when walking past the homeless, but can't our conscience help us do more? 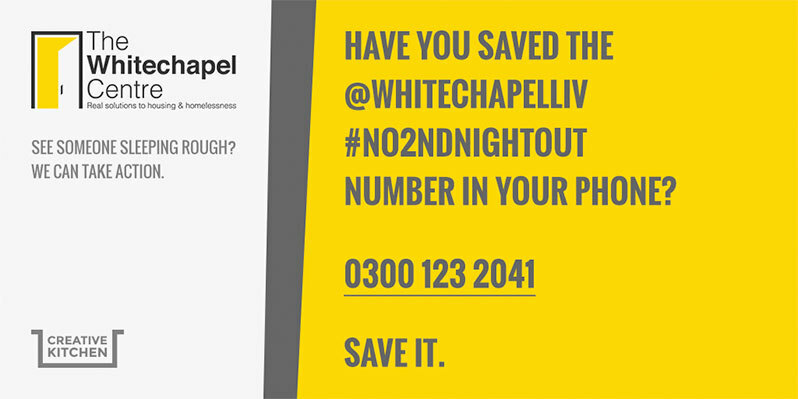 We want to encourage people to add the No Second Night Out support telephone number to their phone and to use it next time somebody is seen sleeping rough on the streets. If they're informed of these people, the support team at The Whitechapel Centre can help those with no home. Please Add 0300 123 2041 to Your Phone! "Fresh" was created by a group of young people going through the CAMHS (Child and Adolescent Mental Health Services) process with Alder Hey Children's NHS Foundation Trust. Building on the positive foundation provided by CAMHS, Fresh wanted to tackle the stigma that surrounds mental health with their own sub-brand, in their own way. The Creative Kitchen is back and we have details of our next series of events planned for June and July to support the creative, digital and tech sectors. In conjunction with The Whitechapel Centre – a charity which aims to tackle rough sleepers, street drinkers and those at risk of facing homelessness – we're looking for donations for our next Creative Kitchen Made Here event from the Creative and Digital community.